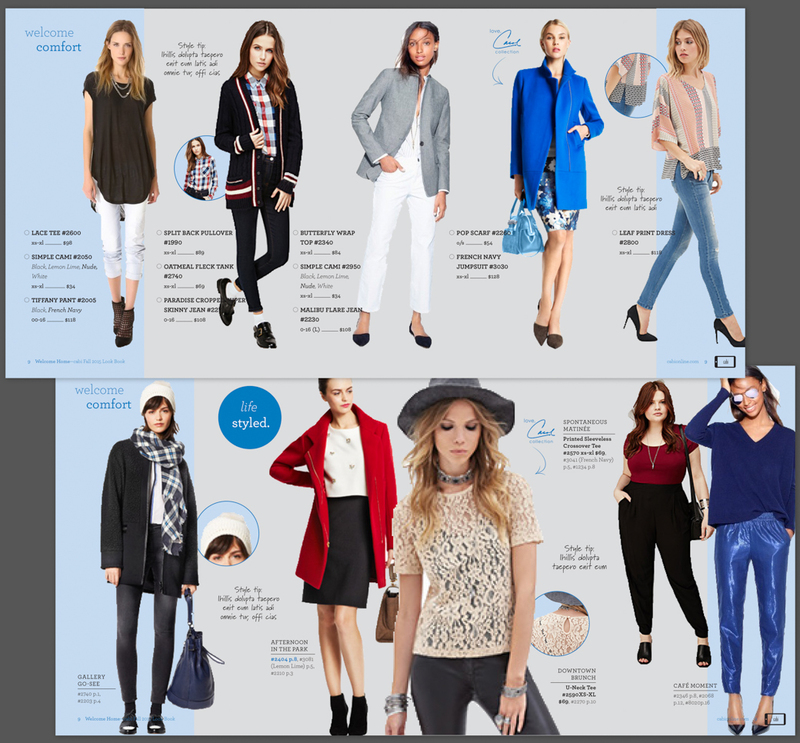 It was that time of the season where I needed to create the catalog for the following season, in this case the Fall 2015 Look Book. This began by first dissecting the previous seasons Look Book and determining what worked well and what was not well received and then comparing that with a list of goals for the future seasons Look Book. 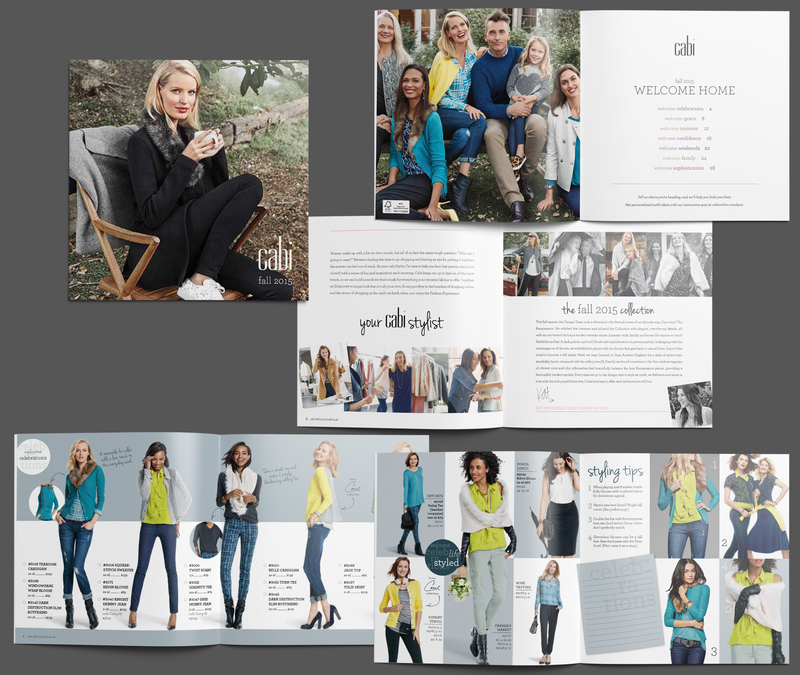 The previous seasons Look Book that I had done was a great success, and our customers especially liked the life styled portion of the book following each mini group within our Spring 2015 collection. 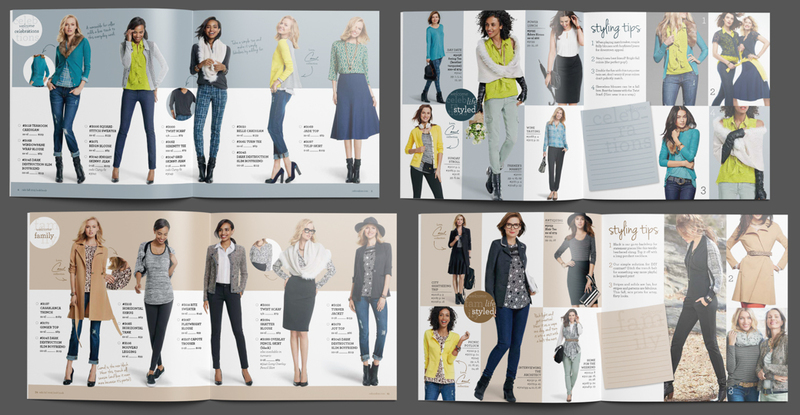 They also really appreciated the color coordinating for each group, with the bleed off the right of the page to help them open their catalogs to their favorite groups without having to page through them. We knew we wanted to keep the end uses within the next season of the Look Book, but we also needed to incorporate “Style & Ideas”, part of our new branding, into this new book somehow. Along with fully rebranding everything we needed to incorporate our new logos and new corporate fonts through out this new book. 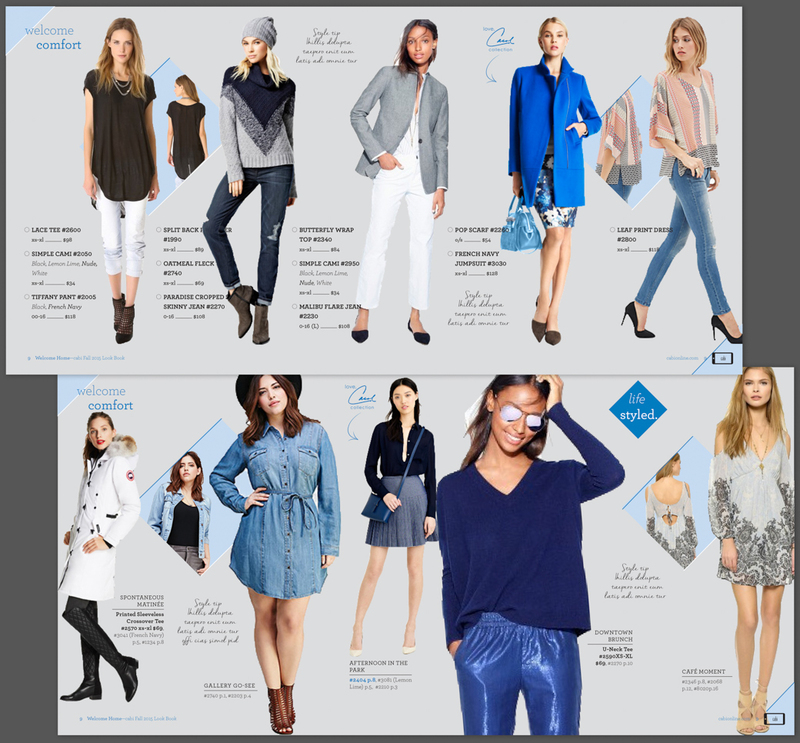 The designers also wanted to draw attention to the smaller details that might be otherwise missed within the catalog images. 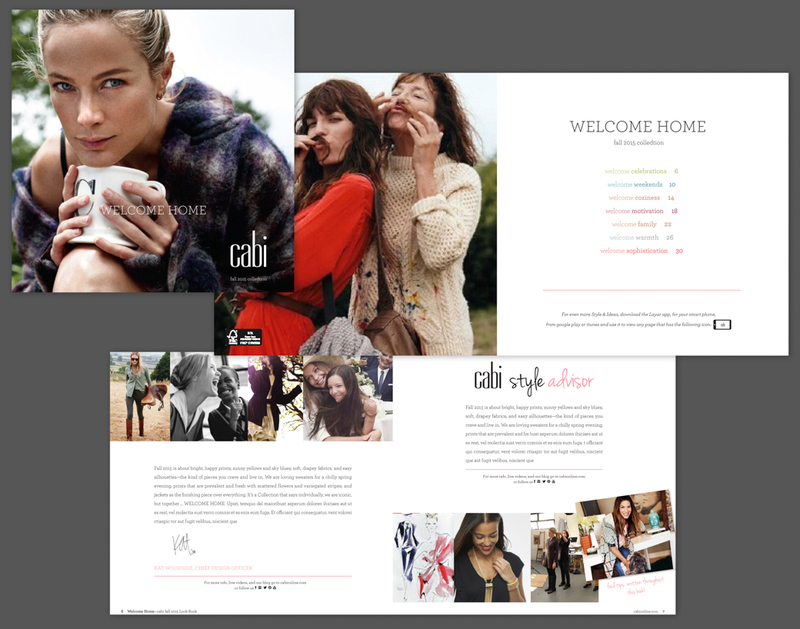 I started this catalog the same way in which I start every catalog, which is with the guts. I set out with 4 different designs on how the original group image would look, and then how it’s accompanying page with end uses would look utilizing random swipes from various places with a look and feel similar to our own clothes. The first idea incorporated bubbles of details, a bubble with the group name in the upper corner and the page in the lower right and small style tips in a hand written font throughout. The second idea also used the style bubbles, but it put a color bar right at the waistline on the main page with the idea that the user could cut the pages on this line and then group up different tops and bottoms from different pages by just moving the top or bottom half of the page. In this instance the accompanying page of end uses would be split apart from it’s main page so only the main pages would get cut in this manner. The third idea had bubbles for details like the others due to my and the creative directors fondness for the style bubbles. 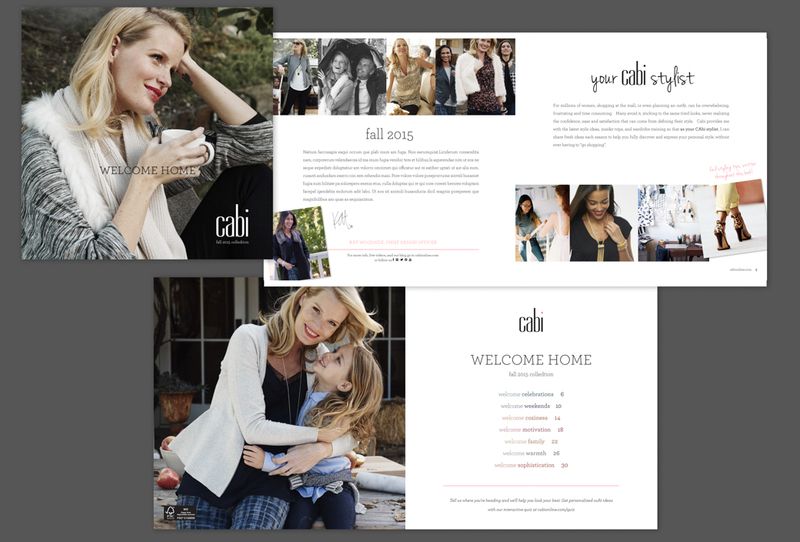 This version utilized colored bars down both the left and right sides of the page in different widths. The final idea I wanted to get away from the circles and do something different, so I went with a diamond shape that when in layout helped give the layout more depth from the diagonal lines, and almost looked like diagonal windows cut out of a grey wall behind the models. The final direction ended up being a cross somewhere between idea 1 and idea 2. 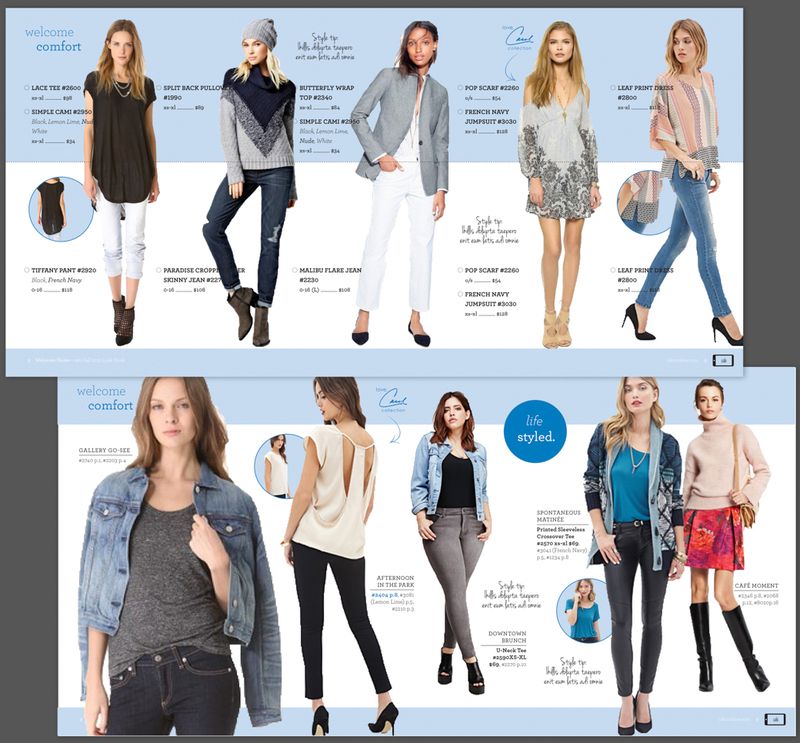 We ended up deciding not to instruct our customers to cut the pages of the catalog in half, as we couldn’t resolve the end use pages nor outfits with long coats or dresses getting too distorted for our customers uses. We also couldn’t control how well our customers would cut on the lines without perforation, which if added would cause our bindery costs to go through the roof. We also needed to incorporate “Style & Ideas” in more then just little handwritten notes throughout the book. I then thought about using augmented reality to increase our “Style & Ideas” as well as new layout that were given to me from the creative director, though really I was just trying to preserve the clean layouts I had already done for the end use pages. Augmented reality could also give us some other opportunities that we hadn’t had in previous catalogs. I started testing ideas with the direction that I couldn’t provide anything through augmented reality that a user who didn’t have the capabilities of using it could not get. 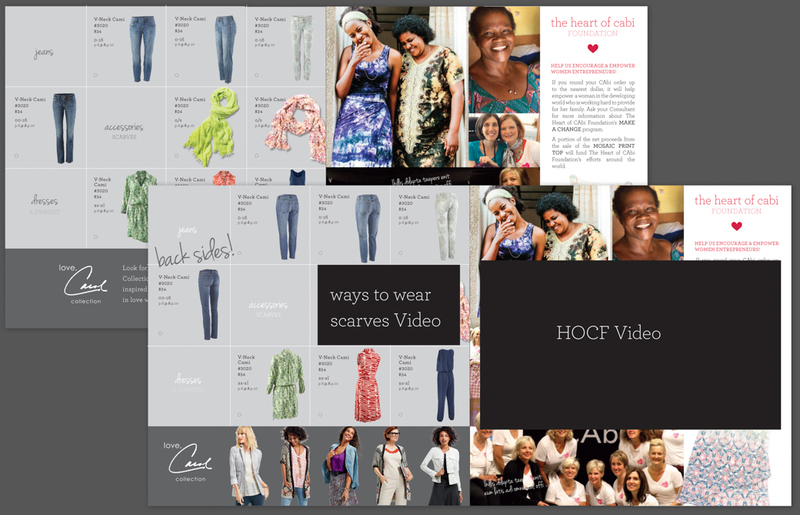 My idea here, was to provide assets from our website directly through the catalog such as videos, complementary looks, alternate views, and purchasing info – all info that any customer could get on their own, but made easier through augmented reality. I began to rough out our entire book to show not only our department what augmented reality could do, but to present to the heads of our company as well. The front of the book could link to a brand video from the current season. 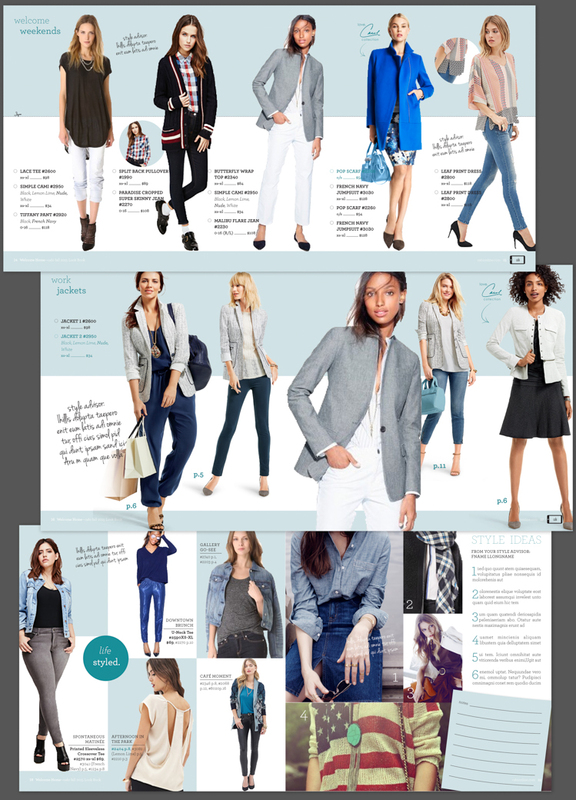 The main group page could change to be a page about a particular item like a pair of jeans or type of look like work wear with cross references to other pages in the book where these items could be found. 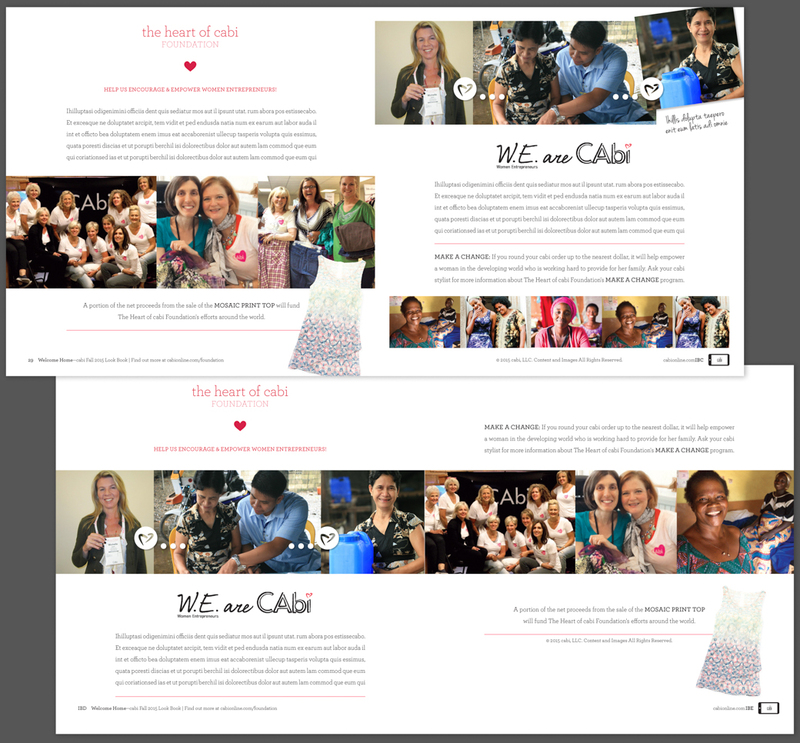 The Heart of cabi Foundation, our charity organization, page could link to our most recent video promoting our good deeds around the world, our glossary pages could show back views of every item, and possibly our career promotion page could link to a video about being a cabi Stylist. As great as the augmented reality seemed, we hit a pretty hard snag. A resolution issue with the company we wanted to partner with for this project. We needed to show high-resolution images, as our customer would demand to be able to zoom in, take screen shots, and send their images to their friends. The company we wanted to work with had no way for us to input high resolution images. We could upload high-resolution images, but the partner company’s software would down sample it and our users would only see the low-resolution images. 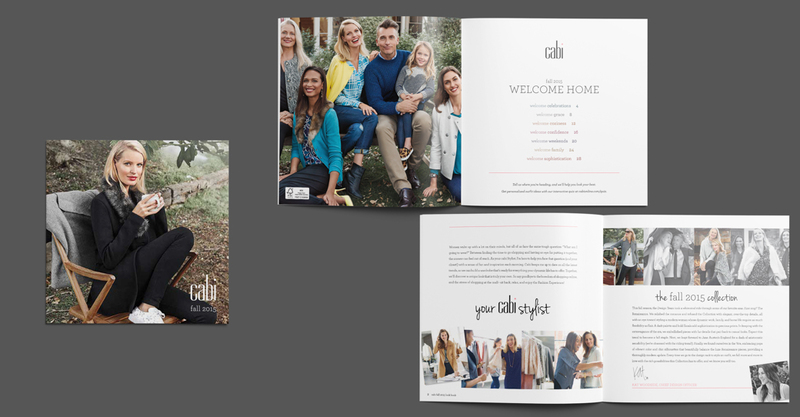 The partner’s solution: To replace individual images instead of full pages. Although this seems like a good and viable solution, it was a poor solution for our customers. If our customers were tech savvy teen agers, this would likely work flawlessly, but many of our customers are older and newer to technology and being that we have never done something like this, we were confident in the belief that having separate augmented reality for every image rather then page would be too complex with our customer and turn them off from our company. Even though all of the execs loved the idea of augmented reality being used in our catalog, no resolution on picture resolution could be resolved in the timeframe we had to complete this book, and thus the augmented reality was killed at this stage. We moved forward with our photo shoot, and quickly I began laying out possible layouts for each of the groups with the photos taken. Next we needed to pick colors for each group based off the colors within their mini collections. I started by matching pantone swatches to the key pieces in each group. Then I set up a grid with mini changes to then print in cmyk color on our large format printer. From here I took colors that were working best and continued to refine. 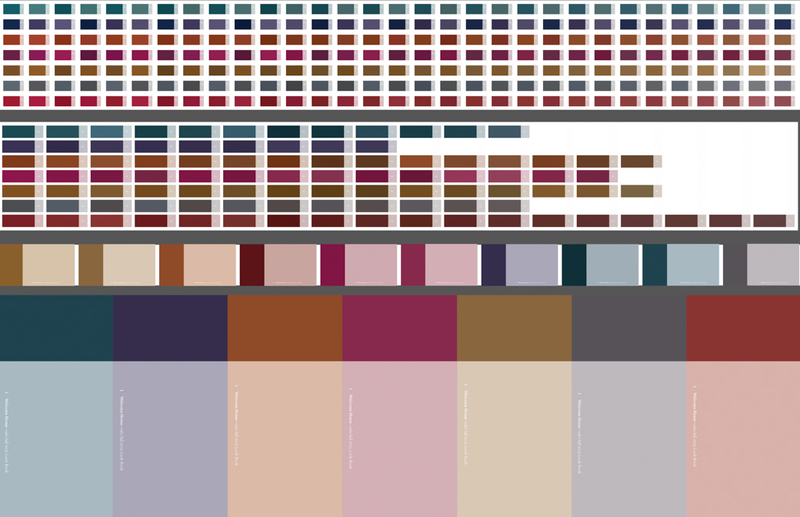 I repeated this step over and over until I had the perfect pallet with the perfect combinations of CMYK for each color. The art director wasn’t entirely happy with the script font used though the book and asked to see other versions, so like the color study I created a font study. Ultimately we used the original font used for the comps. Next the creative director wanted the group names to stand out a little more, and to feel more consistent with the rest of the elements on the page. I ended up putting them into bubbles like the style bubbles, but to make them more dynamic I took the same words, faded them out, and underplayed them under the group names. I reworked the front of the book with our actual photography. 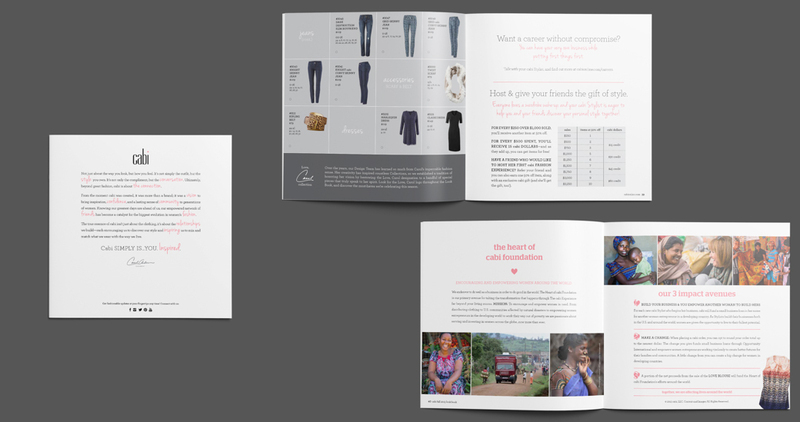 Then I reworked the back of the book to give our foundation a full spread instead of a single page. After all of this work the book was finally finished and ready to go to print. We went through several rounds with the printer to get the color just right and then went on press. Most of the book went very well on press though the cross overs were difficult with the large fields of color, and there was one outfit in particular where a jacket was printing with a more effect, and when we fixed the more we ended up destroying all the detail. My poor creative director got to spend the night at the press for that one.